We get together on the basis of our similarities; we grow on the basis of our differences. “I believe everyone has an inner potential for healing. I work on the holistic principle that our mind, body and energy fields are interconnected. 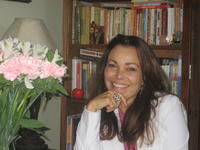 I am trained in energy psychology (AIT) and Transactional Analysis (TA). People decide their own destiny, and these decisions CAN be changed. I offer a nonjudgmental and safe environment in which we build our therapeutic relationship, an important element for healing. I feel rewarded by witnessing my clients inner journey towards wholeness, overcoming fragmentations that prevented them to be the original being we were all born to be. Trauma prevents people to experience the full potential they were born to be. With the resource of energy psychology AIT, I will help you in an efficient, effective yet very gentle way to treat a range of the effects of emotional trauma. I am trilingual (English, Portuguese, Spanish) and have many interests such as the correlation between trauma and illnesses and the interface of culture and psychosocial influences in people's emotional blocks. In my accumulated experience with different cultures, I developed an extreme sense of respect, sensitiveness and appreciation for the distinctiveness of all my clients. I am always looking forward to meet new clients that are motivated and willing to heal. Feel free to know more about me in this website.